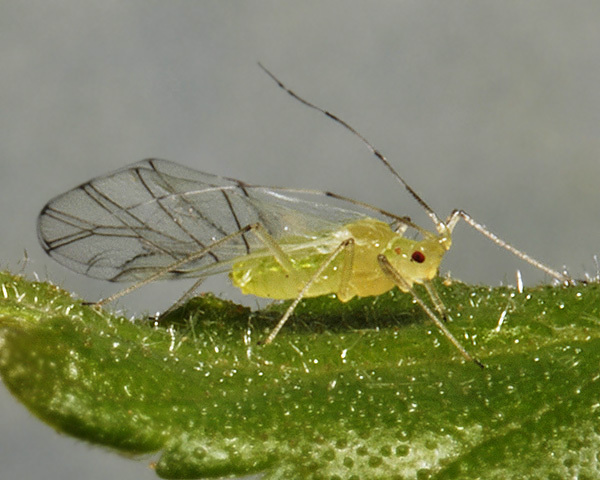 Calaphis are delicate pale-coloured aphids with rather long thin legs. Their antennal tubercles are well-developed and the antennae are longer than the body. They sometimes have distinctive markings and/or dark wing veins, and the radial sector in the forewing is absent or indistinct. In some Calaphis species all viviparae are alate, but others have both apterous and alate viviparae. The genus is sometimes mis-spelt as Callaphis. There are about 15 Calaphis species, 11 of which are in North America, two are European, and one is east Asian. All except one live on birch (Betula spp.). They have a sexual stage in their life cycle, but do not host alternate and are usually not attended by ants. 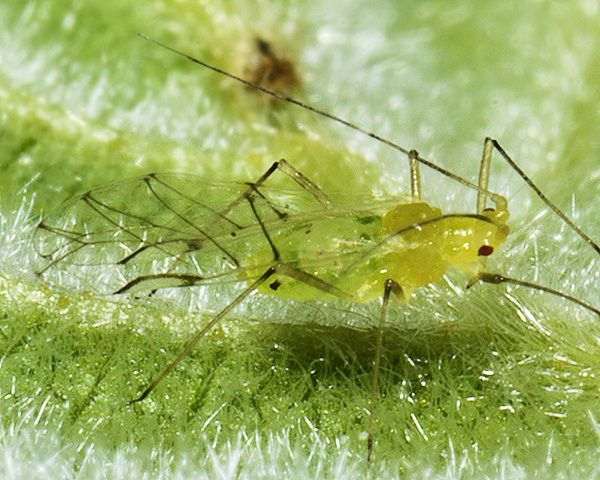 Apterae of Calaphis betulicola (see first picture below) are pale green or yellowish, with dark apices to antennal segments, femoro-tibial joints, tibial apices and tarsi. The head and thorax are pale. The antennae are longer than the body, and the terminal process is clearly longer than the base of the last antennal segment. On Calaphis betulicola the secondary rhinaria are placed towards the middle of the segment (cf. Calaphis flava which has the secondary rhinaria near the base of antennal segment III). The siphunculi are pale but with dark brown tips (cf. Calaphis flava which has the siphunculi pale or a little dusky at the flange). The body length of Calaphis betulicola is 2.0 to 2.3 mm. Winged individuals (see second picture above) have characteristically darkened wing veins, and siphunculi with the apical halves dark brown to black. Calaphis betulicola is found on the undersides of leaves of range of Betula species, including Betula pendula and Betula pubescens, usually on seedlings and small trees less than 1 meter high. It has also been recorded as living on Betula nana in Scotland and Sweden. It is distributed from northern Europe across Russia to China and Japan, as well as in the USA and Canada. The apterae of Calaphis flava (see first picture below) are pale green or yellowish with dark tips to the antennal segments, femoral-tibial joints, tibial apices and tarsi. The antennae are longer than the body and curving. Most secondary rhinaria on antennal segment III are placed towards the base of the segment (cf. Calaphis betulicolawhich has them placed towards the middle of the segment). The siphunculi of Calaphis flava are entirely pale or rarely have slightly dusky tips (cf. Calaphis betulicola which has the apical halves of its siphunculi dark). 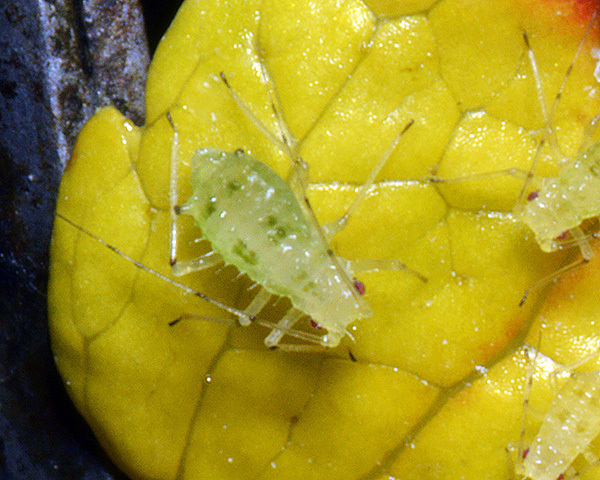 The body length of adult apterae is 1.9-2.7 mm. The Calaphis flava alate (see second picture above and first below) has the wing veins somewhat darkened (cf. Calaphis betulicola, which has wing veins strongly darkened). Calaphis flava favours small bushes of downy birch (Betula pubescens), but is also found on young growth of larger trees and of other birch species. 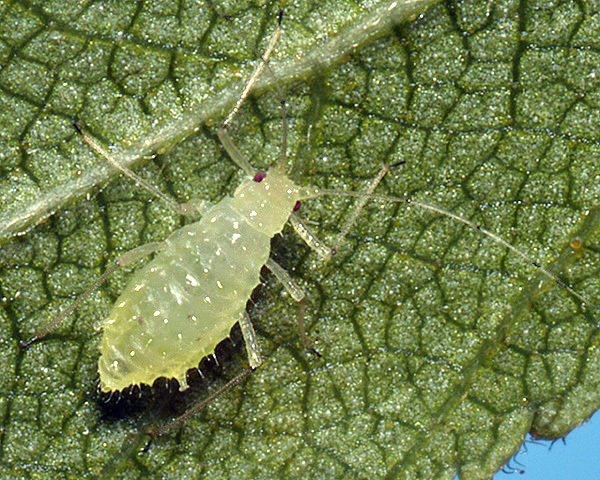 Alate males and apterous oviparae can be found in autumn on various Betula species. It is widespread in Europe eastward in Asia to Siberia and has been introduced to South Africa, Australia and North America.